AFCI protection requirement for some of the circuits in you house has been in place since January 1, 2002. AFCI circuit breaker looks very similar to the GFCI breaker but serves completely different purpose. AFCI breakers protect our houses against the electrical fire hazard, while GFCI breakers protect people against electrical shocks. Arc fault happens when the electrical current jumps from one conductor to another. You might have noticed a small lightning (contact arcing) inside the light switch when flipping it. That’s when the electrical current performs the jump, thankfully it happens inside the switch which has been designed for such events, and we can call it a controlled arc. The electrical current drawn by the arc is very small which prevents the breaker in an electrical panel from tripping. However, the temperature generated in this process might reach several thousands degrees. Now imagine that you’re driving a nail into the wall, which accidentally penetrates an electrical conduit / wires, and causes an arc. If your house is wired with a flexible type conduit (wires are not inside the metal pipe), this small arc might be just the beginning of a big fire… unless this circuit happens to have AFCI protection – an AFCI breaker. AFCI breaker will trip and disconnect the power (deenergize the circuit) if something like that happens. 2008 NEC brought significant changes into the AFCI world, concerning AFCI protection device itself and expanding greatly areas of its application. Instead of AFCI breaker, combination type Arc Fault Circuit Interrupter is now required, and this is not a GFCI – AFCI protection combination. The new type of AFCI breaker is required to detect line-to-neutral, line-to ground, neutral to ground, and series arcing (the previous AFCI detected only first three). Exception No. 1: Where RMC, IMC, EMT or steel armored cable, Type AC, meeting the requirements of 250.118 using metal outlet and junction boxes is installed for the portion of the branch circuit between the branch-circuit overcurrent device and the first outlet, it shall be permitted to install a combination AFCI at the first outlet to provide protection for the remaining portion of the branch circuit. Exception No. 2: Where a branch circuit to a fire alarm system installed in accordance with 760.41(B) and 760.121(B) is installed in RMC, IMC, EMT, or steel armored cable, Type AC, meeting the requirements of 250.118, with metal outlet and junction boxes, AFCI protection shall be permitted to be omitted. All those requirements are for the new construction, but AFCI protection should be considered by anyone as an extra safety measure. Especially older houses with deteriorating wiring should be the number one on the AFCI protection list. 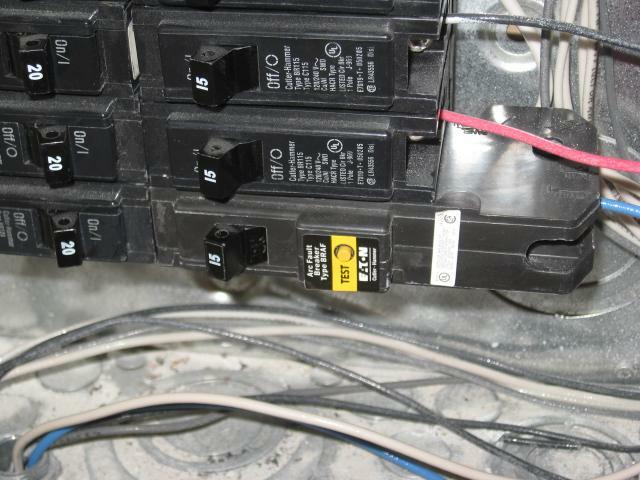 Also, anyone upgrading electrical panel completely or just adding / replacing some circuits should install AFCI breakers wherever they are currently required. AFCIs are not cheap… they are actually pretty expensive ($30 – $50 average for a breaker, but prices will hopefully start dropping with higher demand) compared to the regular breakers (just a few bucks), but fires caused by arcing and sparking happen very often and cause many lives. It’s you choice… AFCI protection might save your life.